Nowadays our �fur babies� play an even greater part in our lives, they are so much more acceptable in social situations, and at family events we wouldn't think to go without them! They have their own passports and so they holiday with us and we spend more time and money then ever on them. This why we have created PucciCouture it's the last word in dog fab! It is a total look and style for the pucci in your life, exquisite fabrics, craftsmanship and attention to detail makes PucciCouture stand out in a crowd. 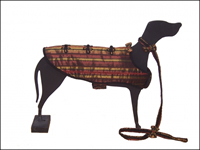 Our beds made in many different styles, fabrics and animal print furs will enhance your home and make your little pooch prince of the pavement or princess of the park!!! There are many fabulous things on our site, all unique and handcrafted by PucciCouture in Hampshire. In our Wedding and O'u La La collection we have six wonderful detailed lightweight coats with matching slip leads. 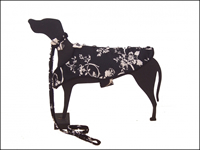 As well as these exquisite coats, rosebud collars, necklaces and ring purses, we offer a bespoke wedding service. 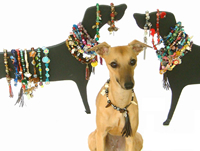 So if you want your pooch to accompany you to an elegant event or posh wedding, maybe they are the ring bearer, bridesmaid or pageboy and need that special little something. We can make anything your heart desires but...Beware these outfits could upstage yours!!! The Gino coat is a stunning silk creation with a black swirl design randomly over the coat. It has a matching slip lead and is dry clean only. Ideal for that special occasion. It has been created to celebrate our liason with Pink Weddings. It can be made to any size. The pink fur sweetheart bed and cat basket is made of supersoft marshmallow coloured fur and is just the thing for a very pampered fur baby.